I firmly believe that there are magical technologies out there in the world, and I also believe that we can access these technologies directly, without the use of books or other formal training. This is something I tell clients a lot – astrology works whether you believe in it or not. It’s a common experience for me to tell a client to, say, “take your energy out of your business and put it into your personal life,” only to have the client say, “Yeah, I’ve been thinking the same thing.” The astral energies I see reflected in the chart are always working on you, and they’re indifferent to your belief in them. An astrologer simply helps you clear away the social pressures and other personal pitfalls which distract you from your true purpose and desire. My yardstick for whether a magical technology has purchase in the real world is its spontaneous appearance to more than one person. For example, if you think you see a ghost in an old house, you might not tell anyone. But if your friend sees the ghost too, suddenly you have a lot more confidence in your own impression. If a whole town sees a ghost at the same time and at the same place, the Pope might have to send out an investigative squadron to research signs of saintliness. I’m being a little silly here, but you get the idea. I think one of the reasons people read spiritual or religious literature is to create this experience – to find validation of what they already believe in the tomes of established spiritual authorities. If you don’t know who Marsilio Ficino is, you should feel just a little bit embarrassed. There would have been no Florentine and perhaps no general Renaissance without him; he translated Plato, the Neoplatonists, and the Corpus Hermeticum into Latin for the first time, and the recent development of the printing press meant that these texts enjoyed wide distribution on the Continent. In addition to reviving ancient mystical ideas which had lain dormant for a thousand years, Ficino harmonized the wisdom of Plato and that of the mythical Hermes Trismegistus into a system which also included Christianity. This syncretic merging of essentially occult ideas with Christian theology was both original and highly influential, and Ficino’s efforts toward universal harmony are what, in part, gave the Renaissance its humanist character. It saddens me to say that no English translation of Three Books On Life was available until the nineteen-eighties, a full five hundred years after the original was published. Nor is this surprising; I’ve come to expect that the more esoteric leanings of great thinkers are suppressed or ignored to perpetuate the myth of the secular progression of history, philosophy, and science. Isaac Newton’s alchemy certainly comes to mind. By now you’re probably wondering what my point is. Essentially, it is this: one of the most talented philosophers and theologians who ever lived was also an astrologer, and he wrote a beautiful book about how to live in harmony with the planets. Ficino’s De Vita was a determining force in the magic of Agrippa and Paracelsus, according to modern-day scholars; his astrological philosophy is also as close to mine as any thinker I’ve come across. Thomas Moore in his aforementioned book on Ficino does a great job explaining that Ficino was the first psychologist, in that all of his health remedies emphasize care of the psyche, or Soul. De Vita is full of fanciful remedies – Ficino frequently advises consuming grains of gold to attract the energy of the Sun, and instructs you in making “pills” filled with wine, crushed lapis lazuli, and fragrant basalms for planetary ailments. You may not be able to implement any of these charming (and expensive!) remedies for yourself, but the very idea of absorbing the essence of what is most soulful in life – fine wine, precious metals and stones, and heavenly perfumes – makes a profound statement about his system. Ficino believed in surrounding oneself with beauty, because beautiful things have Soul. I think the other aspect of Ficino’s system which so attracts me is his cosmic consciousness, his belief that the world is alive and that we draw to ourselves the energies we need through sympathetic magic. To argue that his philosophy partakes of Hermeticism and Neoplatonism will not mean a lot to most people, so I’ll simply say that he followed the doctrine of “As above, so below.” He engaged the celestial bodies as archetypal energies, an overarching cosmic harmony which we can emulate by cultivating Soul in our lives, and by increasing our resonance with certain planetary forces. But they would like him to insert not only lines but colors into the work. There are, indeed, three colors of the world, at once universal and peculiar: green, gold, and sapphire blue, dedicated to the three heavenly Graces. Green is the color of Venus and also of the Moon … Nobody questions but that gold is the color of the Sun, and besides not alien to Jupiter and Venus. Finally, sapphire-blue we especially dedicate to Jupiter, to whom also the sapphire itself is said to be consecrated. For this reason too, on account of its Jovial power, the lapis lazuli, richly endowed with this color, possesses according to doctors the prerogative of curing black bile, which comes from Saturn. Lapis lazuli comes into being along with gold and is decorated with golden marks; thus it is the companion of gold as Jupiter is of the Sun … They therefore judge it useful to look at these particular colors above all, in order to capture the gifts of the celestial graces and, in the model of the world which you are making, to insert the blue color of the world in the spheres. Because the heavens are most exactly tempered and possess in themselves the most absolute life, it can be conjectured that insofar as other things approximate that temperance and life, so far they will be endowed with a more excellent degree of life. I was married on the Vernal Equinox in 2011, when the “Sun reached the first minute of Aries.” The astrologer Demetra George was one of the wedding guests, and noted this as the precise minute we said our “I dos.” It was a Sunday, which irked some of our out-of-town guests, but we kept coming back to this potent energy of the “world’s birthday” for our electional. (An electional is a chart chosen for a momentous occasion, and selected for its auspicious astrological configurations). It’s not a perfect chart by any stretch, but no electional is – you just have to choose your priorities. Dour Saturn was exalted in Libra, sign of partnerships, in 2011, and electing the Moon's conjunction with Saturn was a statement of intentionality about the seriousness (Saturn) of our emotional bond (Moon). But it wasn’t simply Ficino’s singling out of Sun-day and the Vernal Equinox as a fitting moment to reimagine the world which struck me as so uncanny. It was the colors of Venus, Moon, and Jupiter to be put into prominent display in this “figure of the world” that gave me chills when I read the above passage, years after my wedding ceremony. I’ll never forget telling the urban shaman who officiated for us that I had settled on green and gold as my main ceremony colors; he informed me with some dismay that those were also the colors of the local university’s football team. Yet I would not be deterred, even when the florist dismissed the table cloths at the reception site as “golf green.” I made the unconventional choice to wear a green dress with a gold veil, in unconscious homage to Venus and the Sun. When I got to the phrase “green garment” in the passage above, I really felt like I must have been channeling Ficinian ideas in all the quixotic detail that went into the ceremony. Noble Jupiter’s sapphire blues even appeared in the peacock feathers we used for the bouquets, buttoniers, and table displays. We got married in a historic octagonal barn with a soaring ceiling, our “vaulted sky” as it were. I think the reason this passage from De Vita affected me so much was because we really covered that moment in space and time with our own unique energetic embrace, creating a three-dimensional, mobile model of beauty and harmony that I will remember forever. 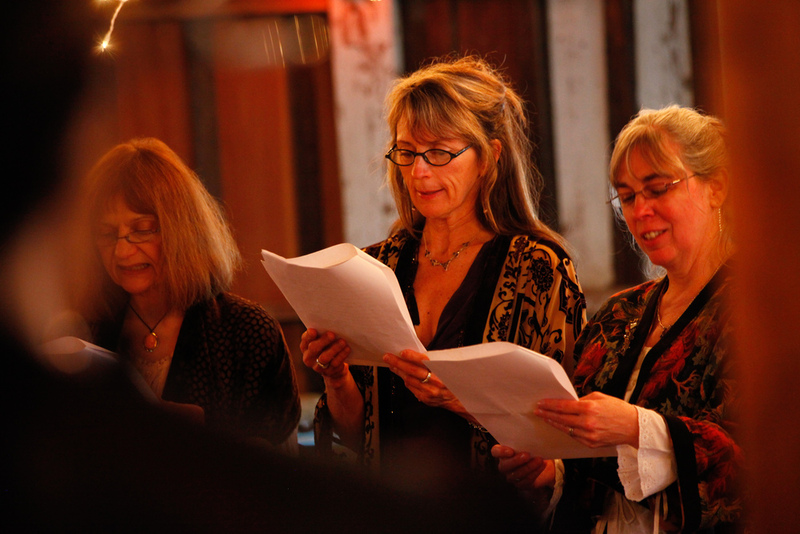 “Three Graces” read from Normandi Ellis’s beautiful rendition of the Egyptian Book of the Dead, Awakening Osiris, while Normandi herself happened to be in Egypt on the Equinox, and so sang out a marriage blessing for us on March 20 in the King’s Chamber at Giza. What exactly does Ficino’s “figure of the world” look like? Is it a painting or a piece of jewelry, or a room decorated to resemble the cosmos? Is it a three-dimensional globe, or a two-dimensional image of the Ptolemaic universe? I’ve offered some suggestions in the images I’ve attached, but I encourage you to interpret his words for yourself, and to create something with the materials you have at hand. What’s your image of a harmonious, living world? Even if you only construct this figure of beauty and harmony in your own mind, be sure and celebrate the first day of Spring with the consciousness that you have the power to draw the Soul of Heaven down to the Body of the World. Orrery constructed by David Rittenhouse, now housed in the library at U-Penn.